Blog Quick Quotes: 2013 New Releases - Albums! 2013 New Releases - Albums! Quick Quotes Scrapbook Company is rolling out complete collections including 6x6 paper pads, cardstock weight papers, quote bundles, wire bound mini albums, chipboard die cuts and stickers. Originally known for our premier kits, classes, Club Q and Private Reserve Educational Extravaganzas, we've taken our designs to the next step! 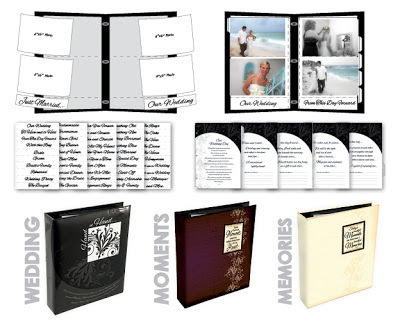 Need time saving photo albums? Check out our Pre-Designed Albums that can be completed in less than an hour! Three great themes include Wedding, Moments, and Milestones. Just add your photos! 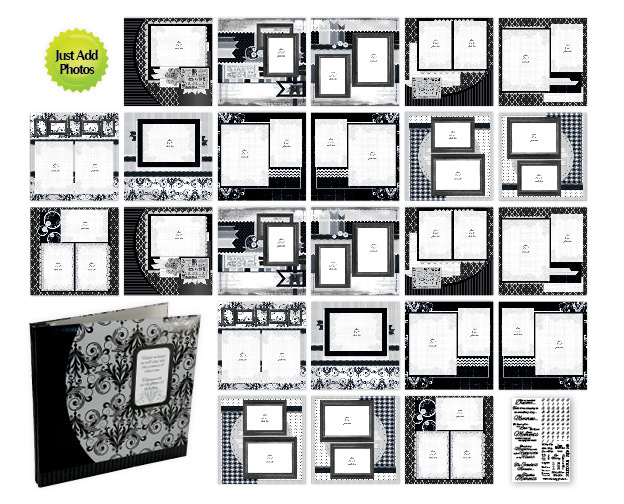 24 Pre-Designed pages accommodate 4x6 or 5x7 photos; printed photo backers showcase suggested photo sizes. Full of unique and original quotes and phrases. Elegant gloss finish photo album. Want a more dynamic and simple way to build your album? Our three all new theme albums make it quick and easy to create a keepsake! This one of a kind album makes telling your story a breeze! 100 photo sleeves, 50 quote sleeves, 5 tabbed dividers and 50 quotes and phrases. Each page contains room for (4) 4x6 photos and (2) quotes or phrases. Use tabbed dividers to add special memories in journaling space provided. Three themes include Wedding, Moments, Memories. Add your photos and a sentiment… done! This could be a great wedding gift! I think this is a fabulous idea ! Would make a great gift for a new bride . I like the theme albums, great time saver for us busy ladies. Almost makes me wish I had a wedding coming up! Wonder if I can talk hubby into a second one. Very nice, I really like the idea of the quote sleeves. What a great product!! Thanks for the chance to win! Clever way to catch up with lots of photos or for someone who doesn't have a lot of time. Great idea and great albums. I'd use it to create a gift! Love the idea! I love Quick Quote products! This year will be our ten year Anniversary and I have been wanting to do a scrapbook with just our wedding. Now I can ! Very very excited! Love the albums--have a son getting married next summer. Perfect solution! Great idea. I love matching sets like the new albums. Love the albums. Already have a project in mind for my brother. Can't wait to get it. LOVE the wedding album! LOVE Quick Quotes! The pre-designed wedding pages look great...could've used those a few years ago when I did my wedding photos. Looks like fun!! A good way to spend a day!! These albums look great. Thanks. This is exactly what I did several years ago in a photo album but did a little journaling next to photo if appropriate. Love this system. What a fabulous gift for the new bride and groom! Cool albums!!! I need that wedding one NOW!! Love the albums....life is so busy - these are a great idea! Wow! this is awesome news congrats! Great idea! Fun way to get lots of photos into a keepsake. These look amazing. I would love to use these. It looks like they would be so fast and simple to get moving on your pages. Thanks so much. These look so great. How exciting. Exciting!! These are just beautiful! I love the themes, the quotes and the albums!!! You always rock!!!! Can't wait to see what you come up with next!!! A nice idea for a quick gift or for those who don't have a lot of time to scrapbook. this would be great for gifts, quick scrapbooking projects or scrapbooking with kids. I would love to get, and then give one of these albums. They are lovely! What a great idea-these would make the perfect gift! What a great idea! I hate to admit I haven't none my wedding yet and this would make short work of it. Love it! Hope to see it in person at the Scrapbook Expo in March! I can't wait to see close ups that show more detail of these. I don't have any weddings so I would love to see more of the other designs. I love that these can be completed so quickly! Maybe I can get caught up with these!!! I could get more albums done with these. Love the albums....what a great way to get a lot accomplished in a short amount of time. What a beautiful album, makes scrapbooking so easy.